RIGGER RAMBLINGS: The Calgary Roughnecks will look to build off last Saturday’s road victory as they host the Georgia Swarm tonight for the annual SUPERHERO Party presented by Pete the Plumber. Game time is 7:30 p.m. at the Scotiabank Saddledome. The Roughnecks will donate $1 from every SUPERHERO Party ticket purchased, along with a portion of the 50-50 proceeds collected tonight, to the Alberta Children’s Hospital Foundation. Fans can head to the Chrysler Club after the action wraps up on the field for a post-game Karaoke Party. Last week, the Roughnecks extended a 5-0 first-quarter lead to an 18-13 victory of the Philadelphia Wings on Saturday afternoon at the Wells Fargo Center. Dane Dobbie led the way for the Riggers with an 11-point effort (4g, 7a) followed by Curtis Dickson (4g, 6a) who tallied 10 points including a third-quarter hat trick in Calgary’s highest scoring game of the 2018-19 campaign. Nine different Roughnecks found the back of the net in the road win including Greg Harnett and Anthony Kalinich who each scored their first goal of the season. Kiel Matisz (2g, 5a) led Philadelphia offensively with seven points while Josh Currier (5g, 1a) had a team-best five goals, four of which were scored in the third quarter. VS. GEORGIA: Tonight marks the one and only regular season meeting between the Roughnecks and Swarm. Last year, Calgary fell 15-12 to the defending 2017 NLL champions at the Scotiabank Saddledome. The Riggers held the advantage heading into the halftime break with a score of 8-6 until Georgia netted six straight goals in the third quarter to take the lead. Calgary is 3-2 against Georgia in their last five matchups with two of those victories occurring on ‘Dome turf. The Roughnecks are 3-4 when playing at home and 3-2 against opponents from the East Division this season while the Swarm are 5-3 on the road and 3-1 versus West Division rivals. Georgia is coming off last Friday’s 17-10 win over the San Diego Seals. Jan. 13/18 at CGY: GA 15 CGY 12… Georgia scored six straight in the third quarter to take the lead and defeat Calgary. ROUGHNECKS VS. DIVISION: West (5-6), East (3-2). PLAYOFF BOUND: With the Vancouver Warriors 12-9 loss to the Saskatchewan Rush on Mar. 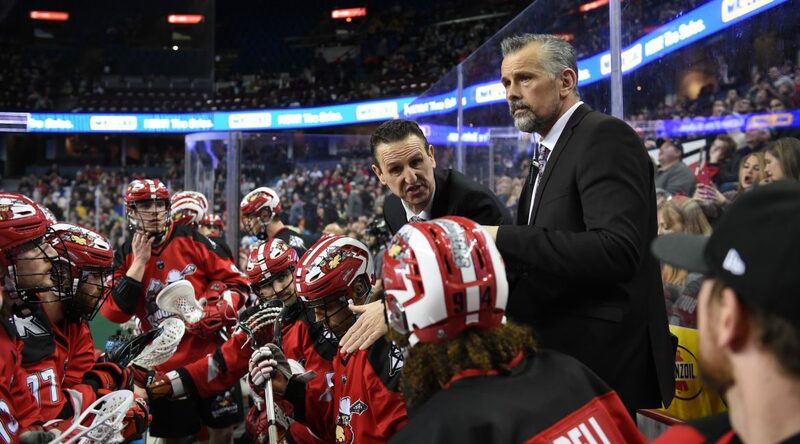 30, the Calgary Roughnecks clinched a playoff spot in the West Division. Since their establishment, the Roughnecks have advanced to the post-season 16 out of 18 seasons. Calgary will look to clinch a home game in the first round of the playoffs with two wins and two Saskatchewan Rush losses. SNIPE SHOW: Three of the league’s top five goals leaders will go to battle tonight: Roughnecks forward Dane Dobbie (39) and Georgia Swarm’s Lyle Thompson (40) and Randy Staats (34). Dobbie’s 39 markers place him at second in the league, behind only Thompson who has just one more goal. Staats sits fifth in the NLL. CLOSING IN ON CENTURY CLUB: Dane Dobbie is one point away from joining the century club for the 2018-19 NLL campaign. His 39 goals and 60 assists have already set a new single season career-high for the 32-year-old forward surpassing his previous record of 90 points from 2014. WE MEET AGAIN: Tonight marks the first meeting between the Roughnecks and their former teammate, Holden Cattoni, after the forward, along with the first round, seventh overall pick in the 2018 NLL Entry Draft, was traded to the Georgia Swarm in exchange for Jesse King and the second round, 23rd overall pick in 2018. Cattoni spent two seasons with the Roughnecks after being selected in the first round, 5th overall in 2016. He amassed 102 points (43g, 59a) in 33 games while in Calgary and has recorded 72 points (22g, 50a) in 16 games with Georgia. SPECIAL TEAMS WATCH: Calgary’s power play is third in the NLL at 48.15% while Georgia is second with 55.17%. The Roughnecks penalty kill is second in the league at 60.32% and the Swarm sit at eighth with 52.17%. GOING ONCE: As part of Del Bianco’s Assists for Kids program, the Calgary Roughnecks goaltender is auctioning off his game-worn helmet from the 2018-19 NLL campaign. The auction opened Mar. 30 and closes on Apr. 14 at 8:00 p.m. with proceeds to support KidSport Calgary. To place your bid, visit elevateauctions.com/DelBiancoKidSportAuction. ROUGHNECKS IN THE NLL TOP 10: Dane Dobbie leads the NLL with 99 points including 39 goals and 60 assists (both ranked second). He also leads the league with 187 shots on goal and with 260 shots. Dobbie is in a three-way tie for second with four game winning goals. The forward is tied for second in power play goals with 11 and tied for second with 17 power play assists… Rhys Duch is tied for second in the NLL with 11 power play goals and tied for tenth with 13 power play assists… Zach Currier is second in the league with 178 loose balls and for caused turnovers with 30… Dan MacRae is tied for eighth in caused turnovers with 23… Eli Salama leads all rookies with two shorthanded assists and is seventh out of the rookies with 58 loose balls. His 11 caused turnovers put him tied at fifth among rookies… Christian Del Bianco has played more minutes than any other goaltender in the NLL with 954.44 and is leading the league with 644 saves. His 11.25 goals against average puts him at seventh in the NLL while his 0.783 save percentage is tied for third. MILESTONE MARKERS: On Mar. 30, multiple players hit milestones including Curtis Dickson tallying his 700th career point, all as a Roughneck while Riley Loewen hit 200 career points and Tyler Pace eclipsed 50. Dan Taylor notched his 50th career assist and rookie Eli Salama scooped up his 50th loose ball. On Mar. 16, Dane Dobbie surpassed 400 career NLL goals while Tyler Burton eclipsed 900 face-off wins that same night. On Mar. 9, Curtis Dickson surpassed 300 assists and picked up his 500th loose ball. WHAT’S LEFT: The Roughnecks host their final regular season contest of the 2018-19 NLL campaign on Apr. 20 as the Saskatchewan Rush visit the Scotiabank Saddledome for Fan Appreciation Night presented by Vision Travel. It’s a 7:00 p.m. start featuring special Fan Appreciation concession pricing. Hot dogs, regular popcorn and 24 oz. soft drinks are all available for $2 each. Fans will have the opportunity to win a multitude of prizes including a trip for two adults at the Iberostar Quetzal, 4-star Mayan Riviera in Cancun, Mexico, provided by Vision Travel and Transat. The grand prize of a 2019 Dodge Ram 1500 will be featured in the King of the Turf contest courtesy of Your Alberta Dodge Ram Dealers. Two lucky fans in attendance will be selected to participate in the giveaway at halftime. The Dueling Piano Kings return to the Chrysler Club to be perform live during the post-game party.